Due to “circumstances” I need to keep this brief. 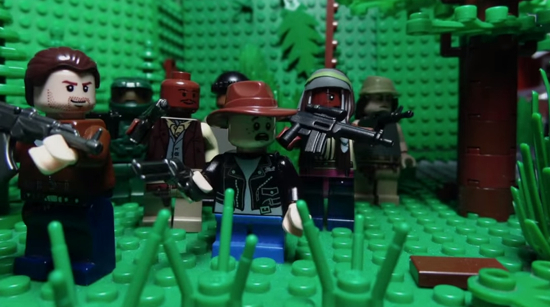 So, here’s the trailer for Season Five of The Walking Dead made with LEGO, thanks to the efforts of Kristo499. I like it. Perhaps the actual show should be LEGO all the time? Might be an improvement. Oh, here’s the “real” trailer for Season Five featuring humans. Which is better? You decide. This entry was posted in Geek, Trailers, TV and tagged AMC, Andrew Lincoln, Comics, Lauren Cohan, Lego, Melissa McBride, Norman Reedus, The Walking Dead, Trailers, TV, Zombies. Bookmark the permalink. There are moments of creepy elegance and elegiac morbidity in The Walking Dead that no show on TV can match. The Walking Dead is finally coming to life, and it’s about time. This is way too well-made a series to be dubbed a “guilty pleasure,” even if a sizable percentage of the audience may watch purely for the visceral thrills of all that weekly bloodletting. What keeps me watching is that while I know there’s a portion of the audience that gets off on the carnage, the show is still about people who are at least conscious of what all this violence, however necessary it might be, is doing to their own humanity.